I ordered four different sausages at Byron's and brought them back to my apartment to devour. 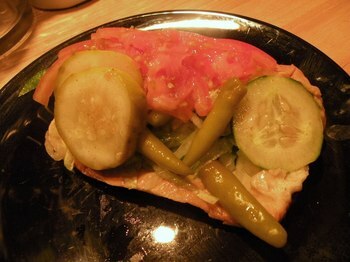 First on the plate was Byron's take on the Chicago-style hot dog. Though Byron's is a Chicago dog and burger stand, and they use Vienna Beef hot dogs, their hot dogs are not Chicago-style. For the sake of creating a healthier hot dog, Byron's uses fresh vegetables and minimizes the use of pickled or vinegar-based condiments. "Everything" means your hot dog comes with shredded lettuce, sliced cucumbers, sliced tomato, green peppers, pickle slices, raw onions, sport peppers, yellow mustard and the "shake shake," a dusting of celery salt and seasoning. Sounds good, right? As it turns out, not really. Take a look at the picture to the left. 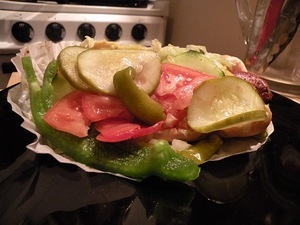 A Byron's hot dog is piled high with veggies. You can't even see the hot dog underneath it all, and you can't you taste it either. I'm all for a healthy dusting of greenery on my encased meats, but in this situation it added nothing to the overall taste. All the vegetables overpowered the potent taste of the Vienna Beef base and caused it to taste more like veggies with a side of meat than a hot dog. There's no balance between condiments and sausage. 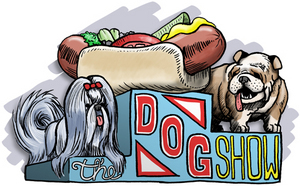 The natural juices from the freshly cut vegetables also cause the hot dog bun to get soggy, and the hot dog quickly disintegrates into a sloppy mess. The construction of the hot dog is poor at best, and unless you like to eat your hot dog like a chop salad, then Byron's version of a Vienna Beef hot dog shouldn't be at the top of your list. I thought the Dogzilla would avoid the problems of a Byron's hot dog, but it had a set unique to itself. The Dogzilla is a pound of hot dog served in a hot dog bun with all the trimmings. It's a behemoth of meat, something that may put you to sleep if eaten too quickly. Since I couldn't taste the hot dog in the normal hot dog, I thought surely I would with the Dogzilla. Now the problem was that I didn't want to taste it. The outside of the Dogzilla was tough and greasy, and wasn't worth biting through to reach the slightly tender inside. I wasn't clear on how the Dogzilla was cooked but from the texture and taste it seems like it was deep fried. The taste wasn't very good, the outside didn't have that snap that it should, and the size didn't do anything to make it a better dog than Byron's regular hot dog. In the case of the Dogzilla, the bun didn't disintegrate -- it just evaporated. Demolished by the size of the sausage and the juices from the mound of vegetables on top, the hot dog bun quickly tore and became more of a condiment than a piece of bread. The Dogzilla could greatly benefit from a heartier bread such as a Turano roll. However I'm not sure if a new roll would make it taste any better. My experience at Byron's wasn't all negative, though. On a whim I ordered a corn dog from their menu and it turned out being one of the better things in my assortment. From my experience, it's hard to mess up a corn dog (though I've heard horror stories that involve state fairs and vomiting). The corn dog at Byron's was everything a corn dog should be -- sweet and fluffy on the outside, and a well-cooked hot dog on the inside. The surprise of the bunch was actually the Polish sausage. 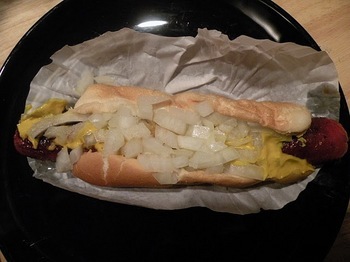 This dog was a foot-long Polish topped with yellow mustard and chopped raw onions. And man, was it tasty. I've often expressed my reluctance to order a Polish because they never seem to be good enough. But the Polish at Byron's reminded me of the Polish I had at Murphy's. It had a nice, smoky taste without that nasty artificial flavor burn at the end of each bite. I was surprised that the sausage that usually is my least favorite turned out to be my favorite of them all. Perhaps Byron's is more of a burger joint than a dog joint. Even if they are the healthiest hot dog in town, I think I'd rather take a normal unhealthy hot dog any day. 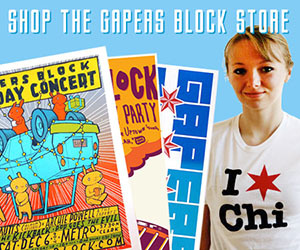 Byron's has two locations in the city: 1017 West Irving Park Road and 1701 West Lawrence Avenue. 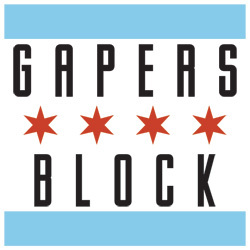 The Irving Park location is open Sunday through Thursday 10:30 am to 10 pm and 10:30 to 11 pm Friday and Saturday. They do not have indoor seating in the winter, though in the summer they do have a tented area next to their establishment to eat in. Byron's accepts cash or credit.